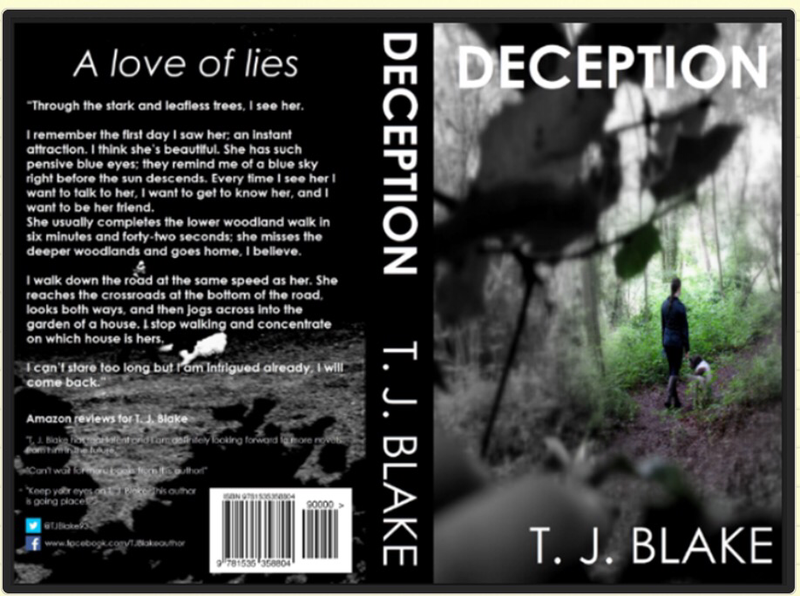 ‘Deception – A Love of Lies’ release date revealed! After two years of research, naming & re-naming, plotting, stalking, dog walking, writing and editing, I can now finally say my fourth novel, ‘Deception – A Love of Lies‘ is now available on Amazon! The release date for Deception is this Saturday, the 30th of July. You can order your paperback now (which will come before Friday if you’re lucky) and you can pre-order Deception eBook. So, the question now is, what is Deception about? If you’ve been keeping up with my blog posts, you’ll know it’s based around an avid dog walker who takes a shining to a female dog walker. I don’t want to give anything at all away though, so I will leave you with the synopsis for Deception. New psychological thriller, Deception – A Love of Lies, out this Friday! The Author will be available for you all to read real soon! I’m so excited for it to be released and for you all to read and hopefully enjoy it. In this post, I’m going to speak a little about The Author – to give you an insight into what kind of book it is and whether you would like to read it. The Author is completely different to my first book Endurance. Endurance was the kind of book where the ideas came to me quickly. I had many ideas for it and I wanted to make it different, which is why I wrote it in the style of horror with segments of sci-fi and dystopia, and a fast paced narrative. The Author however is intricate. Creating the plot was like piecing together a puzzle. It has many twists and turns like Endurance but the story is told in such a different way. The Author is told in the 1st person narrative, from the view of the main character (who happens to be ‘The Author’, Ryan Milligan). The Author also takes more time to introduce the characters in more detail and the setting. I also thought it would be interesting to tell a story which had another story to tell throughout, called ‘Killing For Your Love’ meaning that it gave me the opportunity to try adding the concept of a book within a book idea. The Author builds up slowly but once it gets right into the story, that’s when the book becomes dark, twisted and creepy. I don’t want to reveal any spoilers of the book so I won’t say too much more. But I will leave you with a little teaser (below). ” As I turn to enter, I hear a noise inside. I pause to listen again. Silence. I take the key to the front door from my pocket and slowly insert it and unlock the door. I gently push the door, which creaks the more it opens. As you all know, I completed writing The Author and now it is undergoing the editing and proof reading stage. My new house is only a mile away from the home I used to live in with Tan and the kids, but now I feel like I’m in a different world. I can’t help but feel like I’ve been here before and done this before. There’s a presence here, I can feel it. There are things happening in this house that aren’t normal. I’m threatened by the lack of control I have over them. 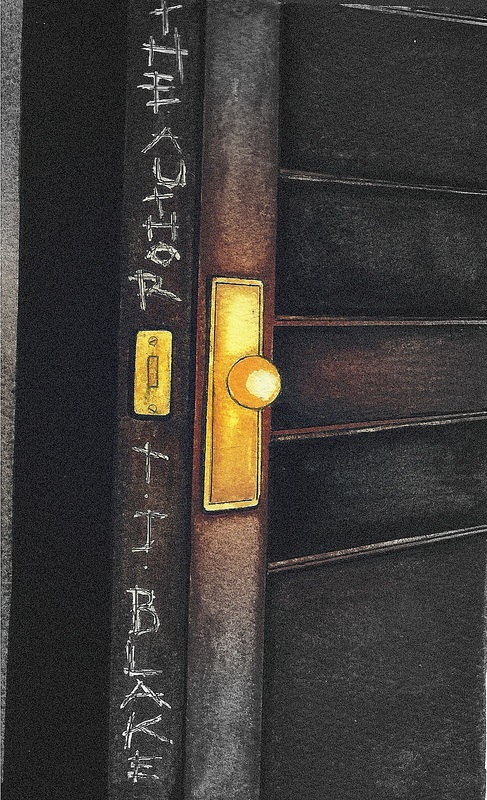 There’s one room where I feel it most, and as I stare at the door leading down into the basement, it begins to creak open. The Author will be available really soon. Definitely by the end of this year but hopefully November 2013. To keep updated about The Author or to see what I’m up to or to read about my other book Endurance, you can follow me on Twitter @TJBlake93. You can go on Facebook and visit http://www.facebook.com/TheAuthor2013 or http://www.facebook.com/Endurance2013 . Horror, Suspense and Mystery novel. Coming soon! Yesterday I sat at home most of the day staring into the light. It blinded me, it began to seep into my brain overtaking my body, forcing me to do things that I didn’t want to do… Well actually I was just staring at the monitor writing The Author but which version of events do you prefer? My point is here, I was writing most the day and I completed writing The Author! I have written it which was a great feeling, I did it much quicker than I thought I would. Writing around University and my part time job is pretty hard most of the time I had a choice of which of the three to sacrifice but I have finally done. I am now in the editing process and I can say that I aim for it to be completed in November! Hello people, haven’t heard from me recently have you? Maybe you’ve enjoyed the time alone and away from me and Endurance. Anyway, I’m back for today, been a little busy lately had work all weekend, it was boring…. As usual. So, I have begun writing my next book, which is a horror novel about an author called Ryan Milligan so hopefully I will have that written in no time! But first, buy Endurance. I am 1000% writing a sequel for it so if you don’t read the first you won’t be able to read the second will you? and who knows, you might really like Endurance. So far I think that most people who have read Endurance have really liked it. So go to Amazon.com or .co.uk get it on paperback or eBook through Amazon, or Barnes and Noble or Super Book Deals or The Book Depository for paperback and get your copy today. I will be writing my next book really soon. I have written lots of ideas for this next book and I think that if I write it well, it will be a really good book and well worth a read, so keep an eye out this summer. I can tell you It’s main genres are Mystery, Suspense and Horror. It’s about an author called Ryan Milligan, he’s moved into a new home. He makes friends with the neighbours and begins to settle in. His wife and two children disappeared 5 years ago and he doesn’t know where they are. As the story goes on, truths begin to unveil and his new home isn’t as it seems. That’s all I’m going to tell you, I will keep you updated. Will be out before you know it! Don’t forget to buy my current Sci-Fi, mystery and action book Endurance! It’s available now at Amazon, Barnes and Noble, The Book Depository and Super Book Deals.